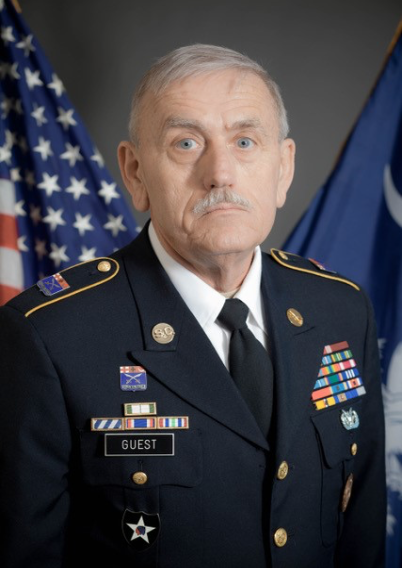 Command Sergeant Major James Guest enlisted in the United States Army in August 1971. He received his Basic Training at Fort Jackson and went on to receive his Advanced Individual Training (AIT) at Fort Sill, Oklahoma, graduating as an Honest Rocket Crewman. During his active duty, CSM Guest was stationed with the 2nd Infantry Division in South Korea from January 1972 until February 1973, followed by the 1st with the 1/31st Field Artillery at Camp Stanley, Korea, and then with the 4th Missile Command at Camp Page, Korea training Republic of Korea (KATUSA) Soldiers the Honest John Rocket System. He then returned to Fort Sill, OK and became an instructor with the Lance Missile System until his release from active duty in August 1973. CSM Guest then enlisted in the United States Navy in October 1973 and was stationed in Mayport, Florida aboard the USS Franklin D. Roosevelt CVA 42 until October 1975. During this time he worked as a GMT (Gunners Mate Technician) with the Special Weapons Division. He left active duty as a Petty Officer Third Class. He then joined the Naval Reserve in 1979 and stayed until 1987 when he left as a Petty Officer Second Class. 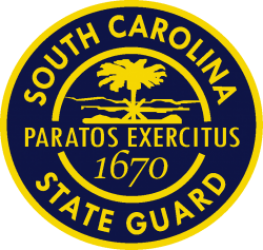 CSM Guest entered the South Carolina State Guard in March 2005 as a Staff Sergeant with the 6th Battalion in North Charleston and became the Unit Recruiter. He then advanced to the Brigade level serving as Recruiter for 3rd Brigade. CSM Guest then moved to the Division Recruiting Detachment as the NCOIC prior to returning back to the 3rd BDE as the NCOIC of Recruiting and Retention. He was promoted to Sergeant First Class in November 2006, Master Sergeant in November 2007, and Sergeant Major in 2009. Command Sergeant Major Guest has been in his current role since July 2014. CSM Guest’s civilian experiences included working as a Federal Police Officer with the Department of the Navy at the Naval Weapons Station in Charleston from March 1988 until January 1999 at which time he became employed with the City of Goose Creek as a Police Officer and served as the D.A.R.E. (Drug Abuse Resistance Education) Officer and School Resource Officer until his retirement in February 2008 after 20 years of service. He is currently working at M.U.S.C. (Medical University of South Carolina) as an Asset Management/Warehouse Operations Supervisor. CSM Guest’s federal awards and decorations include the National Defense Service Ribbon, Armed Forces Expeditionary Ribbon, Army Good Conduct, the Navy “E” Ribbon, Navy Good Conduct, and the Korean Service Award. CSM Guest’s SCSG awards and decorations include the Commendation Medal, Good Conduct Medal, Service Ribbon, Distinguished Service Ribbon, Emergency Service Training Ribbon, Military Proficiency Ribbon, Military Readiness Ribbon, Recruiting (2nd Award), and the Military Emergency Management Specialist (MEMS) Badge. CSM Guest has also received several certificates for Recruiter of the Year. CSM Guest’s SCSG training includes the Advanced NCO Course and Sergeant Major Course. Other credentials include CERT (Community Emergency Response Team) training as well as certification as a CERT Instructor. CSM Guest is married to Janice Nowaczyk, formerly of Toledo, Ohio, for 24 years.